Today's going to be a rather short day. A little more than 25km to Rangiriri. So I'm no hurry. Getting up at 6:30, chatting a little with Sandra, the good soul of the pub, before heading over to the Mercer Service Station for a muffin. The trail is initially along the hills. Steep and due to last night's rain very wet. High grass makes it impossible to view the ground and thus the hike quite adventurous. My legs feel extremely well and my backpack feels so light. Have I forgotten something? I stop and check. Nope - everything here. Cool! Still, the initial part of the trail takes nearly twice as much time than in the trail notes. No problem though. I have enough time. 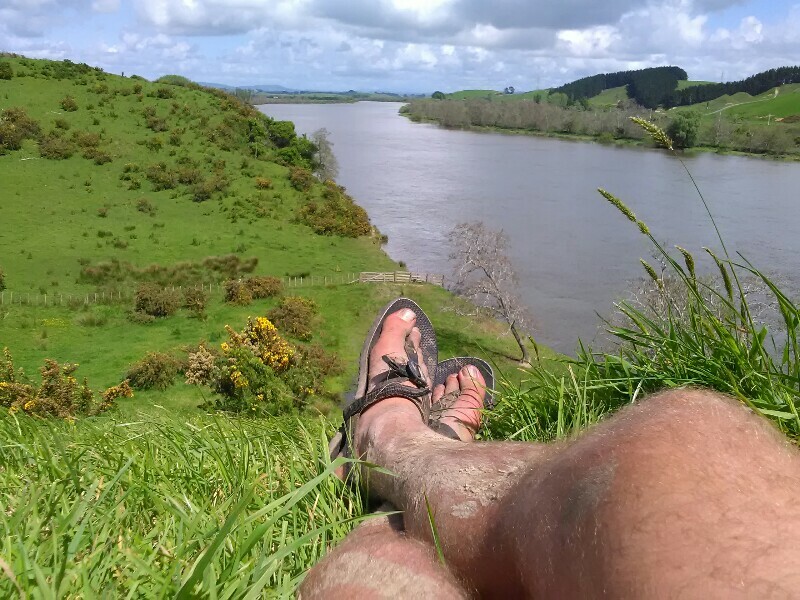 The rest of the day is mostly along Waikato River. I was warned by the owners of the pub that the river is flooded and the trail not walkable. Since it didn't rain a lot during the last 7 days, I give it a try anyway. Worst case: hiking along the expressway. Apparently quite dangerous and illegal. Luckily, the trail is not flooded anymore and very easy to hike. The walk along the river initially takes me to a racing area with heaps of different racing courses. There I meet Pakola, a really nice guy from Toga, who is working on a farm with nearly 700 cows. We talk for over half an hour and I learn a lot about farming once again. Two things struck my as quite amazing: the 700 or so cows produce 12'000 liters of milk every day and, even though the large cows are obviously the most productive, they prefer smaller ones, as the soil is to fragile/muddy for the heavy ones. The track gets better and better and the last few kilometers before the the road are a pleasure with stunning views down to the river. Today I felt simply great. Physically, as mentioned, as well as mentally. Nearly 25% hiked, everything in sandals or barefoot, no sections skipped nor hitchhiked. Many hikers I have talked to/heard of have done so, especially the section I hiked today and the Puketi Forest, which I somehow mastered even with badly aching feet. 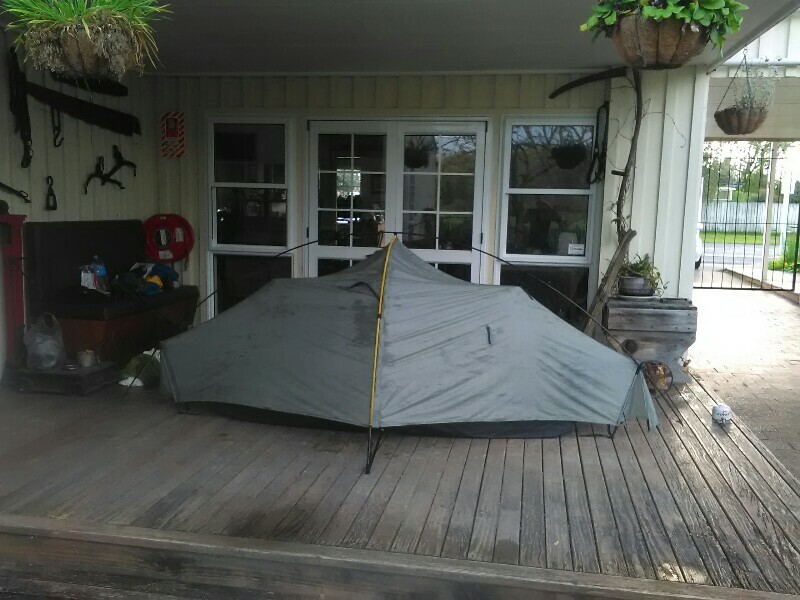 Also the Finnish girl who I met at Ahipara was just a day ahead yesterday, even though she apparently skipped and hitchhiked sections a few times as well (that's what people told me at least). This made me feel a little proud today. Slow but steady seems to be quite a good approach to TA. At least for me. Wow. You have dove done a great job. We are lucky to participate in your experiences. Keep it up and. We are looking forward to your next posts.